March 13, 2015 By Clive Tonge There have been 14 pageviews. 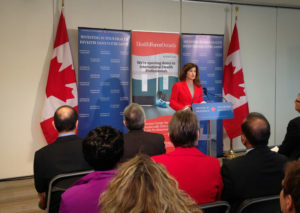 Today, the Honourable Rona Ambrose, Minister of Health and Member of Parliament for Pickering-Scarborough, Corneliu Chisu, announced almost $8.4 million in federal funding for several initiatives that support bringing internationally educated health professionals into the Canadian health workforce so that Canadian families can have better access to quality healthcare services. Across Canada, access to health professionals continues to be a challenge. Approximately 4.6 million Canadians are without a regular family doctor. At the same time, there are around 10,000 newcomers to Canada that are health related professionals. Many of these individuals face obstacles in finding jobs that best match their skills and experience. This support will help prepare doctors and other health professionals for the Canadian workforce. These initiatives complement the Government of Canada’s wider support for improving foreign credential recognition. Federal funding for internationally educated health professionals reaffirms the Government of Canada’s commitment to strengthening the healthcare system by working with provinces, territories and healthcare professionals to improve access to quality care for Canadians and their families.